As Jim loves to say, "Impossible is what we do". A tight spot is bridged on the Artist Loop section. Donations help us to build and improve trails! 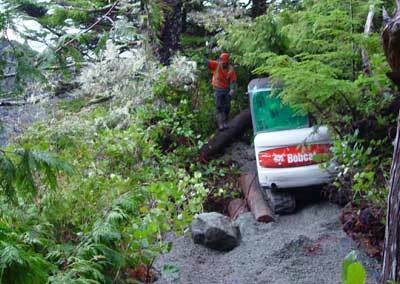 The Wild Pacific Trail (WPT) adheres to strict green trail building practices designed to minimize impact to the forest. 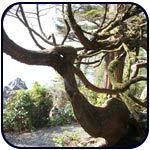 Hand-hewn through coastal rainforest, trail builder Oyster Jim strives to retain all natural features such as moss-covered tree limbs arching gracefully overhead, krummholz-twisted trees, and views of dramatic rocky headlands. “Every section that has been built to the WPT standard has been shown not to damage the forest – no trees dying or blowing over – and the way we build cushions the abuse of foot traffic above the forest floor, leaving it undisturbed,” said Oyster Jim. Krummholz vegetation is an important feature of the coastal environment. This vegetation deflects the wind up and over the upland forest. Usually the significant Krummholz vegetation is cedar trees stunted and formed by the winds. The trail is cited to showcase these zones and is often located just in behind the fringe trees so as not to compromise them. Overlooks and "Painter Perches" are constructed to view the coastline. This low impact trail is just a miniscule part of the forest and one or two feet away you can’t get through the undergrowth. Pull-outs have been made for special viewing nooks near the giant cedars to allow you visit each tree without disturbing the roots. “After just a couple of months of being completed cedar trees drop a bunch of needles and the trail looks like it’s already been there for a long time,” said Oyster Jim. The rainforest would not exist without persistent moisture via fog in the summer and heavy rains in the winter. 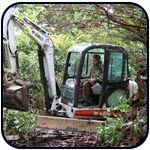 When crafting the path the master trail builder solves problems of hydrology – funneling potential rain runoff away so that the trail remains dry under the rainforest canopy’s natural umbrella. The land decides what is best for trail design and construction. In sensitive areas like the recent Bog Loop, a two year consultation with partners at the University of Victoria--and local experts--resulted in a uniquely narrow trail suspended on gravel covered walkways. The route traces the fringe of the woodland bog, minimizing damage to the wetland. A monitoring project has also been launched. 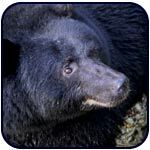 Great care is always taken to avoid disturbing wildlife and habitat. Before the building of the new Ancient Cedars trail a web cam was installed over the winter/spring to ensure a tree-hollow was uninhabited. Then during construction Jim was surprised to discover a doe and its newly delivered fawn on the route – and worked around them to ensure they remained undisturbed. 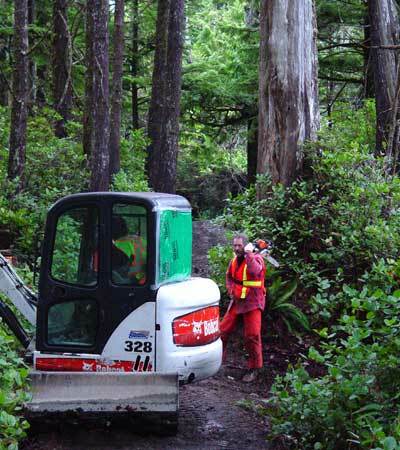 The District of Ucluelet has been very supportive of each new section. “Ancient Cedars and Rocky Bluffs section have especially come to life through their support,” said Oyster Jim. The community has also become stewards of the trail, helping to keep the wild character of the trail intact.